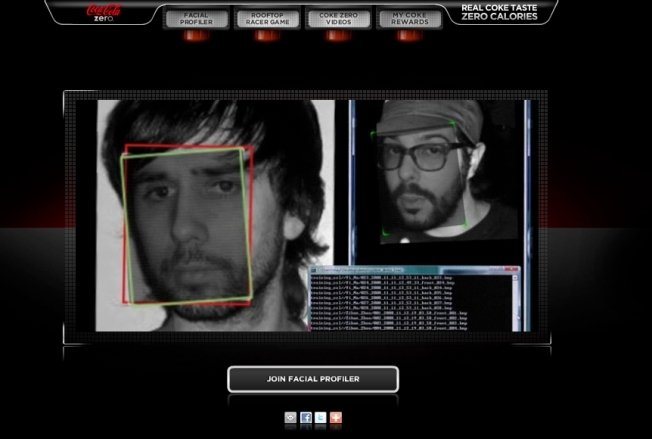 Coca-Cola's Facial Profiler: Creepy or Just Weird? This is the part where it steals your soul. Oh, brands love to connect with you via Facebook, don't they? But they've gone beyond fan pages and apps to using something called Facebook Connect to get into your data nuggets, as it were. And now Coke has something in common with the Grateful Dead: It wants to steal your face. The promotion, aiming to promote Coke Zero with the tag "If Coke Zero has Coke's taste isn't it possible someone has your face?" asks you to add your photo to a "social experiment" in the hopes of finding your lookalike so that you can then "connect" with them. Great. Just what you wanted: a creepy doppelgänger who you are virtual friends with. The best part may be the laughably bad name, "Facial Profiler." Really? Making a pun on a racist policing practice is the way to go? Of course, Coke is just one of the many, many brands and advertisers looking to connect with you on Facebook, and that is why you, dear social networker, are lining Mark Zuckerberg's pockets. Let's say Facebook has a $6 billion valuation (in fact it does), that means that some portion of that value is attributable to you based on your activity and the number of friends you have and your "influence." In conjunction with his new book "Viral Loop," author Adam Penneberg has come up with, yes, a Facebook Connect App that tells you exactly what you are worth in dollars to, well, Facebook. Then you can even see what you are worth compared to other users and celebrities -- at press time Ashton Kutcher was worth $630,466.20, Megan Fox $969,324.40, and God $587,496.20 (at least He is more valuable than Jackie Chan).